Abbott's Grill in Milford scored a perfect 10 with attendees on Saturday, March 19th at the first ever, Lydia's 'Kiss My Sass' Chilifest. The fundraiser was held to benefit survivors of domestic violence. The chilifest idea came from People's Place board member, author Lucille N. Payne, whose novel, "Dancing in Quicksand", explores why women stay in abusive marriages. One of the novel's characters, Lydia Wright, wrote a cookbook of oddball chili recipes. Ms. Payne challenged the chefs at Abbott's to create tasty versions of Lydia's chilies - based on the scant descriptions in the novel. 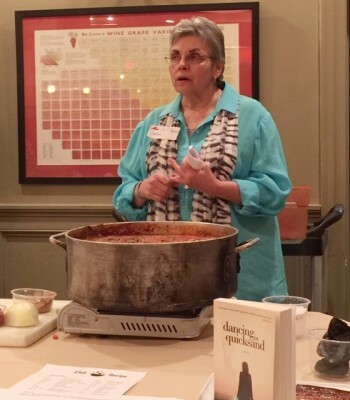 Abbott's co-owner and event planner, Laura Burton, suggested the chili-tasting fundraiser piggyback Abbotts' monthly cooking-demo class scheduled for March 19th. That brilliant idea lead to a phenomenal display of cooking prowess enjoyed by all. 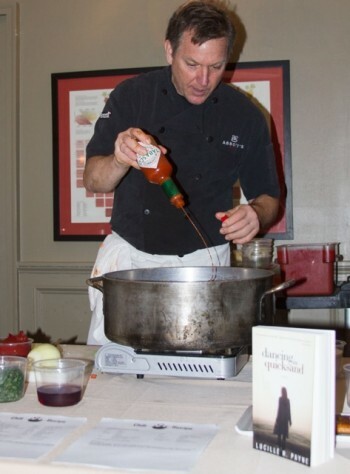 Co-owner and head chef, Kevin Reading, started the event with a cooking demo of his Bison Chili recipe along with a smoked eel and a chicken liver chili rendition from Lydia's fictional cookbook. Following the demo, the group was asked to sample and rate six of Lydia's recipes. The winning dish, Pulled Pork Aloha Chili, was created by Jay Millman. Recipes were available at each tasting station. Ms. Payne has always enjoyed eating at Abbott's and notes that much like the fictional chef in the novel, Abbott's has a knack for turning the mundane into something marvelous. "They know how to cook, and they know how to run an event. My hats off to the chefs and my thanks to both Laura and Kevin for helping local women and children who are survivors of domestic violence." "Dancing in Quicksand" is available at Browseabout Books in Rehoboth, Biblion Books in Lewes, and Bethany Beach Books in Bethany Beach. It is also available online at www.amazonbooks.com; and a portion of book sales through March will be donated to the SAFE and Abriendo Puertas programs at People's Place.